Man and Nature - 100 Years in Þingeyjarsýsla: The new exhibition, Man and Nature - 100 Years in Þingeyjarsýsla, aims to provide insight into man's relationship with nature in this region in the period 1850-1950, and the subsistence farming that was practised at that time, so that each farmstead was largely self-sufficient. This interesting aspect of national culture is explored by juxtaposing objects from nature and man-made artefacts. The show includes a large number of interesting exhibits - some of natural origin such as animals, plants and rocks, while others are home-made objects, for instance tools, needlework, work of art and craft, etc. Maritime Exhibition: The Maritime Exhibition includes a large number of boats, many of them built in Húsavík, as well as Hrafninn (the Raven), a gift from Norway to the community of Húsavík to mark the 1100th anniversay of the settlement of Iceland 1974. The exhibition also includes a wide variety of fishing gear, equipment and tools which were used in the fisheries, as well as in seal-hunting and shark-fishing. Films can be viewed, and the exhibition offers an interesting interactive history database, where information on such matters the location of fishing grounds, farms with driftwood rights, landing-places for boats, etc. is presented in map form. On the ground floor of the Culture House various temporary exhibitions and events take place. The location of the farm of Grenjaðarstaður dates back to Iceland's settlement over a thousand years ago. For a long time it was one of the area's chief farms and became the site of a church, parsonage and post office. With a floor area of about 775 m2, the picturesque turf house that currently exists was one of Iceland's largest. Its oldest part is from 1865, and people continued to live in it until 1949. The house was opened in 1958 as a local heritage museum, displaying over a thousand donated items. To wander through and imagine how life once was will provide a unique experience for any age group. An exhibition about the post office that used to be operated at the farm is on show and in the service building an interactive multimedia shows how the turf buildings gradually evolved. As well as free coffee and tea, facilities are provided for eating your own food. 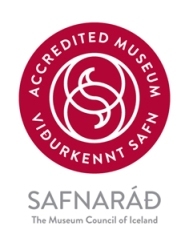 Located at Snartarstaðir farm, two kilometres from the village of Kópasker, this museum presents a unique collection of local objects showing daily life in the 19th and 20th centuries. There is a wide array embroidery, woven goods, knitted clothing and many other unique, interesting handicrafts. In addition, the museum contains a variety of quite different objects: toys, guns, wood carvings, blacksmith products, a firefighting cart and much, much more. The museum also contains the library of Helgi Kristjánsson, from the nearby farm of Leirhöfn. Helgi was well known for bookbinding and the woollen caps he made.